Running relies on the right tension and strength in the muscles of the legs, hips and back. Muscles that are too tight limit the running action and are often inhibited in their power. Muscles that are too elongated require more control, power and stability to produce the optimal function. Long or repeated training with no wrap around prep or care can lead to poor conditioned muscles that over time get shortened and inefficient. Help prep, recover and optimise your muscle function with these simple exercises. Release exercises are a form of massage that reduce tension and thickening of the muscles and surrounding connective tissues. This improves the transfer of loads though the body. To do these you’ll need a spikey massage ball or tennis ball. You can start by repeating these exercises from 30-60 sec up to 5 mins on each, applying moderate pressure to create a deep tissue massage sensation but not sharp joint pain – this would indicate that the ball is in the wrong position. Start with the ball under the base of the toes and roll it to the heel with a moderate downward pressure. 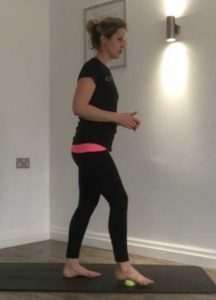 Next, leave your big toe on the ball and allow the base of the big toe to rest towards the floor to improver the range of motion- Big toe flexibility is essential for a good stride length. Without the ball, start peeling the foot off the floor whilst keeping the toes down. Progress this by placing the stretch foot behind you and rock from the back to the front foot. Imagine lengthening the foot with each rock int the big toes. Either in sitting (as shown) or laying on your back, place the ball under one bottom cheek and go side to side. Once you have identified an area of tender spasm or tightness, remain in that place as you glide your leg down the mat and in, repeating the flexing and extending action. Now reposition the ball and you turn slightly onto your side repeating the side to side gliding of the hip on the ball then holding for a lowering and lifting of the underneath leg. The ball should be placed int eh fleshy muscular part of the bottom/hip and not directly on to the joint. Caution: Do not do if you have had a Total Hip replacement or if you have hip pain that worsens with twisting. Please see Physio to learn the best stretches in your situation. Action: Cross one foot over the opposite knee. Keep the hips down on the floor and press the knee away with your hand. Progress this by lifting the legs towards you, hugging the supporting leg in and pressing into the stretch side with your elbow. 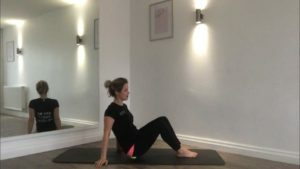 With both of these you are work further into the muscles by gently gliding the knees away from the stretch side whilst maintaining the position. Benefits: Stretching of all the fibres of the hamstrings; neural mobility. Caution: If you have sciatica or a disc bulge stay upright and extend the leg out straight. Do not push into your symptoms. Action: In a lunge position fold your body forwards over your knee and pushing your hips backwards till you feel a stretch. If you can’t reach the floor use some blocks or chair to lean on. You don’t have to fully extend your knee. Holding this position gently turn the leg inwards and outwards whilst maintaining the folded position. Progress by extending the leg further out straight but keeping the hands on the floor. Benefits: Hip flexor and quads stretch; Improves balance between front and back of the hip. Cautions: If you have knee pain in this position adapt it by one of the following: Adding a cushion under the shin to elevate the knee off the floor; Tucking the toes under; performing it in a standing lunge with no contact on the floor. Action: In a kneeling position tuck the tailbone under and imagine pressing your knee into the floor. If you have more flexibility allow your body to move forwards but keep the bottom muscles switch on and knee pressed down. Progress this by reaching the arm up into the air in either of these positions to get a whole side body stretch. In order to reach peak performance, make sure to include strength and conditioning exercises alongside a consistent routine of stretching and release. 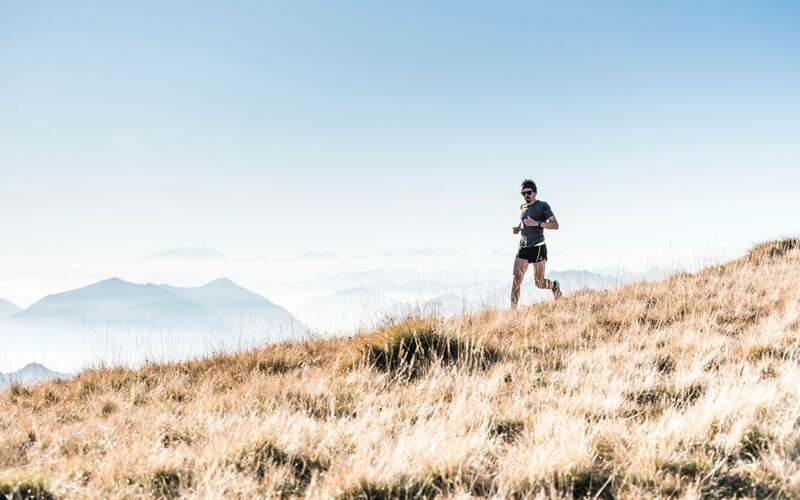 Towards this, please check out our article on strength and conditioning exercises for runners.